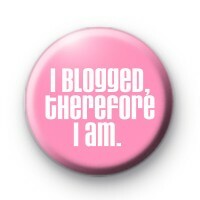 Cute pink 1 inch badge with the slogan I Blogged Therefore i am. Do you keep a blog or know someone that is always busy blogging. This would make a fun / sassy gift for any blogger in your life.